This sweet image from A Day for Daisies must be retired but I couldn't resist using it. Hope you will stop by ADFD and look around her amazing shop. Tammy's creativity is amazing! I love everything she creates. I'm sure you will too. 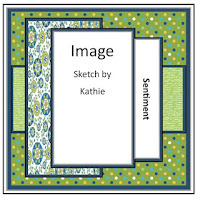 Please play along at SSW2 to have a chance to win a $12 gift certificate at ADFD. "A Day For Daisies began as a small token to a constant need to create. Pairing a love of whimsical illustration, with a tidy graphic design background, Tammy S Thompson, produced her first stamp designs, introducing irresistibly sweet stamps to crafters around the globe. Drawing inspiration from the beautiful world around us, she strives to express the happiness and gratitude she feels in each stamp design she creates. Presently, A Day For Daisies has grown to over 3,000 Digital Stamps with a quickly expanding line of Best Loved Clear Polymer. A Day For Daisies has been published and awarded over the years for innovative and unique designs created to inspire the crafting community. With a whole team behind her now, she remains passionate about illustration, obsessed with quality, and dedicated to her customers. A Day For Daisies thanks you for your ideas, comments, and creativity!" 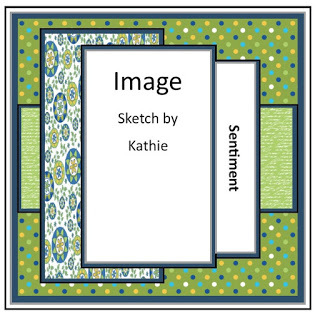 This is gorgeous Judi, I love your colour scheme and that is a lovely image that you have used. 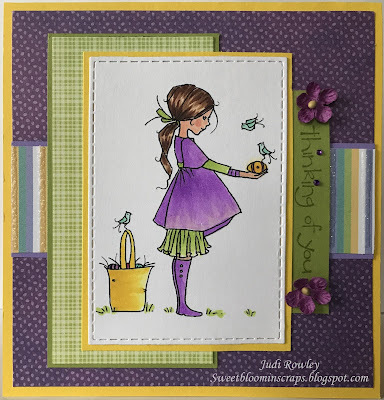 Oh Judi, what a lovely card some of my very favourite colours and this image is so sweet this is a real girly card. I love it.